- EGYPTE - Concerned archaeologists called today on Egypt’s Prime Minister Essam Sharaf to return police to archaeological sites. The move is required to put an end to illegal excavations and wild looting of storehouses and tombs. “The desecration of archaeological sites and monuments is not only a huge loss for the people of Egypt on a national, economic, and human level, but is also a loss to all of humanity and to science,” Tarek El Awadi, director of the National Egyptian museum, said in an open letter to Sharaf. Following the revolution that toppled President Hosni Mubarak last month, a new unprecedented wave of looting and vandalism took place at various sites in Egypt. In the past few weeks, looters have removed inscribed blocks from tombs at Saqqara, Giza and Abusir, and even tried to cut into pieces a colossal red granite statue of the 19th Dynasty king Ramesses II at the southern quarry of Aswan. One of the biggest losses is the tomb of the royal scribe Ken Amun in Tell el-Maskhuta, near Ismailia. Dating to the 19th Dynasty B.C (1315-1201 B.C. ), the burial is the first ever Ramesside-period tomb uncovered in Lower Egypt. Discovered last year, the burial featured beautifully decorated walls which are now a lost memory. Sadly, the site has been completely destroyed. Meanwhile, holding together on social networks, Egyptologists and archaeologists have started an international petition campaign to call for the restoration of adequate security to the sites, storehouses, monuments and antiquities of Egypt. - INDE – Sawri - Department of ancient Indian history, culture and archaeology (AIHCA) of Nagpur University has begun excavations of a megalithic circle near village Sawri in Bhadrawati tehsil. The archeologists are optimistic of uncovering details of the culture, trade and customs prevalent in the ancient era during the excavation. The site is located close to the bank of Irai dam near the boundary of Tadoba Andhari Tiger Reserve. This unique megalithic circle was discovered last year. Megalithic circles provide a unique, rich source of material to the archaeologist for reconstructing the life-ways and customs of ancient societies as they not only yield physical remains of human and animal skeletons but also cultural material like pottery, weapons, valuable ornaments etc. Till date hundreds of megalithic circles have been excavated near Nagpur area. The antiquities recovered from this megalithic circle will be compared with evidence from other places in the light of special traits like presence of a single megalithic on a flat land and appearance of cup mark on them. The megalithic circle being excavated by quadrant method admeasures 9.20 x 8.80 meters in diameter. It has been observed that the circle is made by huge red metallic stones and inner pit is filled by small pieces or metallic rubble. A copper coin was recovered on the very first day of excavation. Some pieces of pottery and rim portion of pottery along with some leg portion of terracotta bull etc too have been recovered so far. Archaeol ogists are planning to take one more trail trench on the bank of Irai, the place where Sawari village was located earlier before it was shifted to present location. At Sawari an interesting and unique anthropomorphic statue is located about 100 metres away from the megalithic stone circle. Such statues are reported from very few places in Andhra Pradesh and Karanataka state. The evidences of this anthropomorphic statue signifies interesting features of the megalithic communities, like their behaviour attitude and belief in their customs concerning life after death. - ROYAUME-UNI – Tregaron - The last resting place of a circus elephant, said to be buried in the grounds of a Welsh pub, could finally be revealed. In 1848 a travelling circus passed through the Ceredigion town of Tregaron when its prized exhibit was taken ill and died. The Tregaron Elephant has since become part of local folklore. Its remains were reputedly buried in the back garden of the town’s Talbot Hotel, though the grave’s exact whereabouts remain unknown. Next month the School of Archaeology, History and Anthropology at the University of Wales Trinity Saint David will begin a week-long dig to trace the grave, part of a wider project celebrating the elephant which has acquired mythical, almost mascot-like, status in the town. Dr Jemma Bezant, from the School of Archaeology, said the Elephant Project would form part of research investigating medieval history at Strata Florida’s Cistercian Abbey and the region’s wider history. 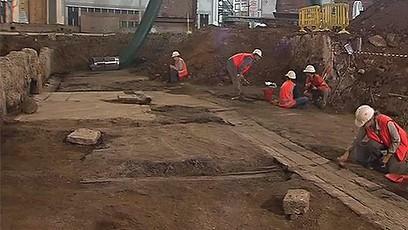 - AUSTRALIE – Brisbane - A cobblestone street and horse stables from Brisbane's pioneering past have been discovered during excavation work at City Hall. The relics, believed to date back as far as the 1850s, are the most significant archaeological finds in the city's history. Further, careful excavation also uncovered an intact drain, building roofs, old horse shoes and bottles. Archaeologist Phil Habgood said details of the city's past spanning as much as 80 years, up until City Hall was built in 1930, could lie underneath the historic building. "We've got evidence of corrugated iron buildings [underneath City Hall]," he said. "The buildings were made from porphyry [stone] then they added concrete and bitumen throughout the area. We think there's probably a large 1850-60s stone drain. "We've only got a very small section of the story so far." The area already unveiled runs the full 50-metre length of the hall from Ann to Adelaide streets and spreads 15 metres wide. "There's potential that the streetscape will continue right across the auditorium. There's nothing like that in Brisbane," Mr Habgood said. "We're clearing and cleaning up the street surface and then tomorrow we're going to start drawing it so we've got a drawing record of it."